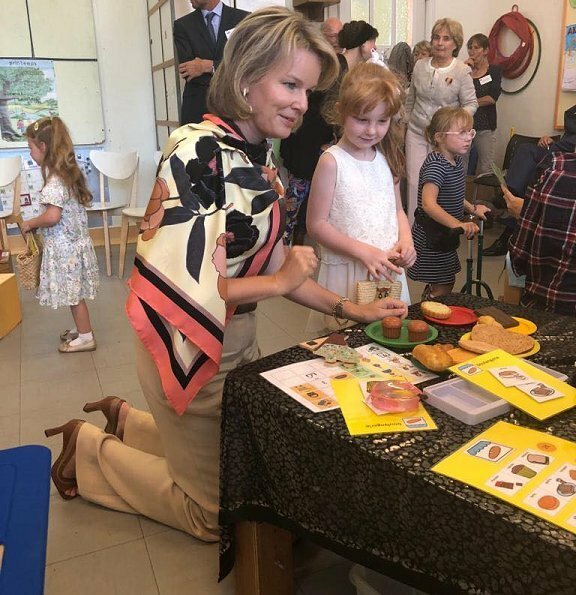 On September 18, 2018, Queen Mathilde of Belgium visited La Famille Educative Center which celebrates 50th anniversary of its establishment. The queen was then given a tour of the school, taking part in activities along with the youngsters. The family school in Brussels offers education and therapy for children with disabilities. Queen Mathilde wore a scarf-print blouse by Dries Van Noten Spring/Summer 2018 collection. I like very much this outfit. Scarf and shirt are a huge miss. Two different patterns that do not complement each other, and the way the scarf is tied is just weird. Some things should stay on the runway. Agreed that this is a miss, but disagree about the runway. It should not be there either. I think it was intended this way by the designer and I believe it is innovative but fits perfectly together. 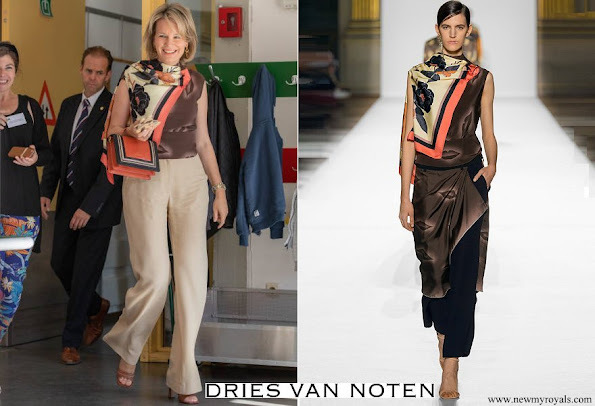 I like the scarf-top…… but best together with the shirt/pants, Mathilde should have choosen the whole outfit, instead of the beige pants! I agree. I am not a fan of those pants, but I do like the runway outfit. Not the best look for Q Mathilde. Mathilde is very elegant. And as always seems very professional! This looks like a try to be fashionable but it's a complete fail. Mathilde has unforunately the wrong advisors. Nice and different. The bag is propably a little too much.